Last weekend I had the pleasure of spending a lazy Sunday afternoon taste testing margaritas. We don't typically break out the tequila, but when there's sunshine, blue skies, and spicy shrimp on the menu, sometimes a cold brew just doesn't seem to rise to the occasion. Mady was mixing up all kinds of good stuff with Espolón - blood oranges, grapefruit, kumquats, pomegranates, and mango were all making great friends with tequila, lime, and agave. These shrimp are quickly marinated in a mixture of Espolón tequila blanco, canola oil, lime juice, cumin, and chile powder. All that good stuff gets thrown together with some sautéed red onion, serranos, jalapeños, and LOTS of garlic. Yum. You can definitely make all kinds of variations to this recipe depending on how spicy you want it, how brothy you want it, etc. We enjoyed it as a late lunch but if you wanted to make it a bit more substantial, these shrimp would be really good spooned over some cumin-spiced rice or even in a pasta. The broth by itself is delicious and you're definitely going to want some crusty bread to soak it all up. For the marinade, mix all the ingredients in a bowl. Pour the marinade over the shrimp (either in a large bowl or a gallon-sized zip-loc bag) and toss to coat. Let marinate for 20-30 minutes. 5-10 minutes before the shrimp are ready, heat canola oil in a large, heavy-bottomed pot until shimmering. Add diced red onion, chile peppers, chile powder, cumin, salt, and pepper. Sauté everything over medium heat for 5-10 minutes until onions are soft. Add garlic and sauté 2-3 minutes more. Turn the heat up to medium-high and add the tequila, scraping up any brown bits at the bottom of the pan. 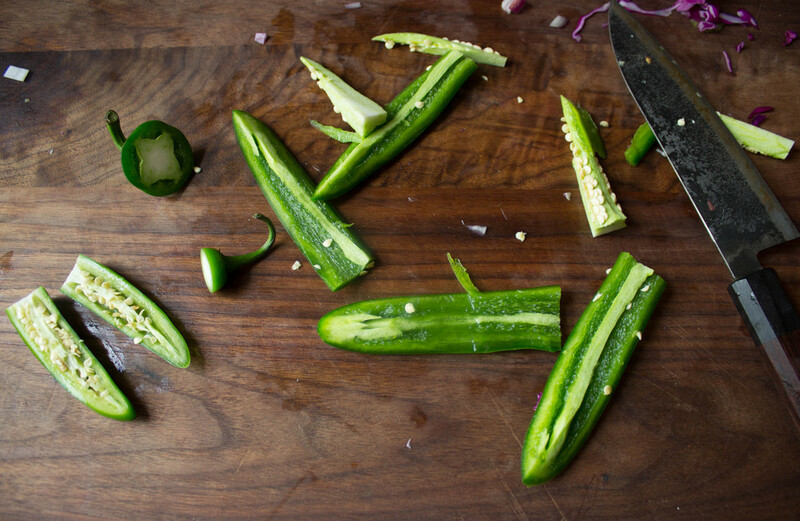 Let tequila sizzle for 2-3 minutes. Add shrimp and marinade to the pot, bring everything to a boil, and turn down the heat to medium-low. Add boiling water a few tablespoons at a time until you get the broth consistency you’re looking for. Simmer everything until the shrimp are cooked through, tossing the shrimp around every once and a while to make sure they cook evenly. The shrimp should look nice and pink without any translucent spots, but be careful not to overcook them. Taste for seasonings and add salt and/or extra chile powder if needed. Ladle shrimp and broth into bowls. 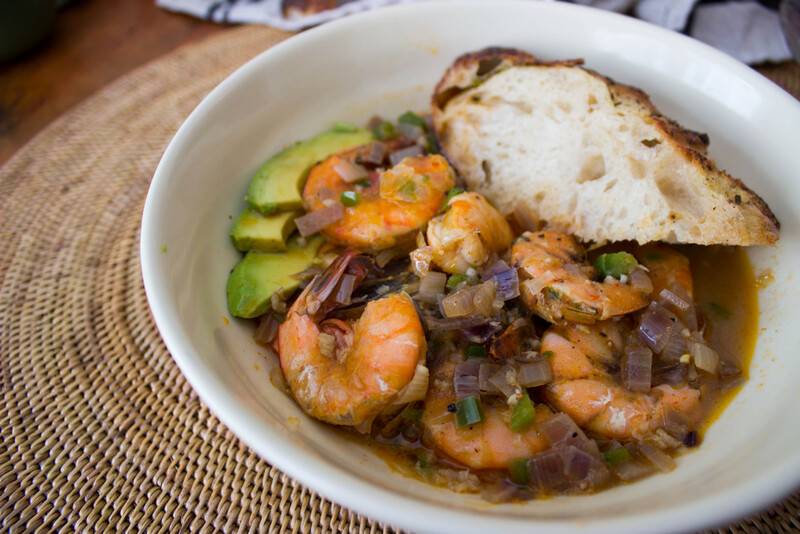 Serve with avocado slices, lime wedges, chopped cilantro, and lots of crusty bread to soak up the spicy broth. Enjoy!